Treatment Scores: Quantifying the science of medicine behind medical treatments. So how does it work? First, you receive a diagnosis from your physician. You want to know all your treatment options. One diagnosis can have upwards of 10, 50, or even 100 treatments. You also want to know which treatment is right for you. 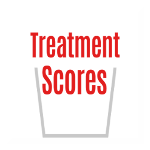 Treatment Scores gives you a personalized list of possible treatments. Each treatment on the list is given a Treatment Score. The Treatment Score is the number produced from a statistical analysis of the medical literature on that treatment. It summarizes the net treatment benefit for patients who have been treated in the past. You can share your Treatment Scores report with your doctor and discuss your options together. Take control of your healthcare. You need Treatment Scores. We all need Treatment Scores. Follow this blog by entering your email address in the box at the top right. You MUST CONFIRM your subscription VIA EMAIL. Then, you will automatically receive all new posts. If you have any problems, search for "feedburner" to make sure the confirmation email did not go into your spam folder. You must consult your own licensed physician, or other licensed medical professional, for diagnosis, treatment, and for the interpretation of all medical statistics including Treatment Scores. Treatment Scores are for educational purposes only. Treatment Scores may be incomplete, inaccurate, harmful, or even cause death if used for treatment instead of consulting a licensed medical professional. No medical advice is being given. We DO NOT CLAIM to cure, treat, or prevent any illness or condition. Nor do our services provide medical advice or constitute a physician patient relationship. Contact a physician or other medical professional if you suspect that you are ill. Call emergency services (call 911 if available) or go to the nearest emergency room if an emergency is suspected. We are not responsible for any delays in care from using our website, our services, or for any other reason. We are not responsible for any consequential damages of any nature whatsoever. We make no warranties of any kind in connection with our writings or the use of TreatmentScoresBlog.com or TreatmentScores.com. Treatment Scores are about what happened to patients studied in the past; they do not predict the future. Copyright © 2017 Treatment Scores, Inc. All Rights Reserved.